NASA opportunities for the education community. Full descriptions are listed below. Sorry Dr. Strangelove You can’t prove that NOT that having your privacy respected by the American Government will harm you. Might as well know that it is the exact same thing as living in China. If you’re worried about the United States government tapping your phone or perusing your emails, don’t complain to the US Supreme Court about it. They don’t want to hear it. Today, the court ruled that citizens cannot challenge a federal law that allows for warrantless surveillance of international phone calls and emails. The ruling was a blow for civil rights activists and lawyers, and a victory for the Obama administration. The justices voted 5-4, largely along ideological lines, in favor of the law, which was implemented in 2008. They claimed that the citizens represented by the American Civil Liberties Union-including Amnesty International, lawyers, journalists and international human rights activists-could not sufficiently show that they were actually being harmed by the potential surveillance. Food companies shape health legislation and avoid regulation and are making us sick! Three companies now account for more than 40 per cent of global coffee sales, eight companies control the supply of cocoa and chocolate, seven control 85 per cent of tea production, five account for 75 per cent of the world banana trade, and the largest six sugar traders account for about two-thirds of world trade, according to the new publication from the Fairtrade Foundation. Multinational food, drink and alcohol companies are using strategies similar to those employed by the tobacco industry to undermine public health policies, health experts said on Tuesday. In an international analysis of involvement by so-called “unhealthy commodity” companies in health policy-making, researchers from Australia, Britain, Brazil and elsewhere said … that through the aggressive marketing of ultra-processed food and drink, multinational companies were now major drivers of the world’s growing epidemic of chronic diseases such as heart disease, cancer and diabetes. This is done by “building financial and institutional relations” with health professionals, non-governmental organizations and health agencies, distorting research findings, and lobbying politicians to oppose health reforms, they said. Billboard produces water out of air. According to the university, the billboard produced 9,450 liters of drinking water in three months—enough to sustain hundreds of Peruvian families per month. Billboard converts air into water. An advertising agency has created what it’s calling the world’s first billboard that converts air into drinking water. The billboard—a collaboration between agency Mayo DraftFCB and Peru’s University of Engineering and Technology—was placed in Peru’s rain-starved desert capital, Lima. Lima gets less than an inch of rain per year on average, but since the city’s humidity hovers around 98 percent, generators attached to the structure are able to capture atmospheric moisture, filter it and produce potable water. The harvested water is then stored in 20-liter tanks and can be retrieved from taps at the base of the billboard. “Agua aqui,” a neon display near the base reads. 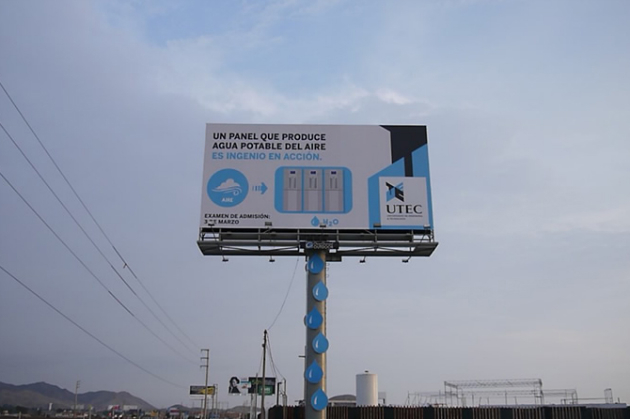 According to the university, the billboard produced 9,450 liters of drinking water in three months—enough to sustain hundreds of Peruvian families per month. International Dairy Foods Association (IDFA) and the National Milk Producers Federation (NMPF) have <https://www.federalregister.gov/articles/2013/02/20/2013-03835/flavored-milk-petition-to-amend-the-standard-of-identity-for-milk-and-17-additional-dairy-products>filed a petition with the FDA asking the FDA to alter the definition of “milk” to secretly include chemical sweeteners such as aspartame and sucralose. This isn’t only for milk, either: It’s also for yogurt, cream, sour cream, eggnog, whipping cream and a total of 17 products, all of which are <https://www.federalregister.gov/articles/2013/02/20/2013-03835/flavored-milk-petition-to-amend-the-standard-of-identity-for-milk-and-17-additional-dairy-products>listed in the petition at FDA.gov. The FDA is requesting comments on this petition. You have until May 21st, 2013 to submit your comments. Six Strikes is not a law only a 4 year private agreement. Six 6 Strikes is Phoney it is only a MEMORANDUM OF UNDERSTANDING not a law. ISP snooping is disgusting. It isn’t enough to say you have rights you have to use them to prove that have rights. Pete Seeger – Where’s your conscience? Six Strikes is not a lawonly a 4 year private agreement. Six 6 Strikes is Phoney it is only a MEMORANDUM OF UNDERSTANDING not a law. Administering “six strikes” is a new entity called the Center for Copyright Information (CCI), which was established by the entertainment industry and the ISP industry. (Internet users were not part of the negotiations.) In other words, Internet users can be punished because of accusations by the copyright industry, but no one is necessarily verifying the claims. First, this plan is not a law at all. It is a voluntary agreement between copyright holders and ISPs. Second, this plan does not mandate that ISPs completely cut subscribers’ Internet access. The burden of proof on the Internet subscriber, who must prove that he did not illegally download copyrighted content. The Recording Industry Association of America, Inc. The Motion Picture Association of America, Inc.
Jill Lesser, CCI as executive director.who previously served as a First Amendment advocate for People for the American Way (PFAW), most recently served as a senior vice president for domestic public policy for AOL Time Warner. She now leads the CCI as executive director. The executive board of the CCI includes: chairman Thomas Dailey, vice president and deputy general council at Verizon; executive vice president and general counsel Steven M. Marks, currently the executive vice president and general counsel at the RIAA; and members Marianne Grant, senior vice president for the MPAA; Alan Lewine, senior counsel for Comcast; Daniel Mandil, associate general counsel for Verizon; and Brent Olson, vice president of public policy for AT&T. The advisory board is made up of Gigi Sohn, president and chief executive of Public Knowledge; Jerry Berman, chairman of the Congressional Internet Caucus Advisory Committee; Marsali Hancock, president of iKeepSafe.org; and Jules Polenetsky, director of the Future of Privacy Forum. CCI also begins doing business as a number of judicial rulings have blocked copyright holders’ attempts to compel ISPs to divulge the IP addresses of customers without a formal lawsuit. The CCI’s partnership between the content creators and ISPs would sidestep that process. ACCORDING TO THE CCI Executive Committee THEY GET TO DEFINE YOUR RIGHTS ACCORDING TO SOMEONE THEY PICK. A Subscriber shall prevail on this defense if the Subscriber adequately and credibly demonstrates fair use of the copyrighted work under prevailing principles of copyright law (which shall be identified as described in section 6). Page 35 Section 6. Legal Principles to Be Applied in Independent Review. The Independent Review process will, to the extent relevant, apply prevailing legal principles as determined by United States federal courts. The Administering Organization will commission an accepted, independent expert on copyright law, who is approved by the CCI Executive Committee, to outline prevailing legal principles of fair use for purposes of deciding defenses of fair use, and any other legal principles necessary for resolution of issues within the scope of this Independent Review process. Such outline will be updated from time to time as necessary. If additional material questions of law arise as the Independent Review process is implemented, they may be referred to an accepted, independent expert approved by the CCI Executive Committee as needed. The Administering Organization will advise the Parties to the Agreement of issues referred to, and principles determined by, such an expert, and provide a process for the Parties to the Agreement to provide input concerning the issues, so as to ensure that the expert’s determinations are fully-informed and reflect prevailing law as determined by United States federal courts. If additional material questions of law arise as the Independent Review process is implemented, they may be referred to an accepted, independent expert approved by the CCI Executive Committee as needed. The Administering Organization will advise the Parties to the Agreement of issues referred to, and principles determined by, such an expert, and provide a process for the Partiesto the Agreement to provide input concerning the issues, so as to ensure that the expert’s determinations are fully-informed and reflect prevailing law as determined by United States federal courts. This immediate open-access policy involves extra money taken from science budgets to pay publishers. has only applied to biomedical science. based in College Park, Maryland. accessing articles on publisher sites, for example. access at a time when demand for the agency’s funding was high. IEEE Computer Society is the source that computing professionals trust to provide high-quality, state-of-the-art information on an on-demand basis. IEEE Computer Society is the world’s leading computing membership organization and the trusted information and career-development source for a global workforce of technology leaders including: professors, researchers, software engineers, IT professionals, employers, and students. The unmatched source for technology information, inspiration, and collaboration, IEEE Computer Society is the source that computing professionals trust to provide high-quality, state-of-the-art information on an on-demand basis. The Computer Society provides a wide range of forums for top minds to come together, including technical conferences, publications, and a comprehensive digital library, unique training webinars,professional training, and a TechLeader Training Partner Program (T2P2) to help organizations increase their staff’s technical knowledge and expertise. To find out more about the community for technology leaders, visit http://www.computer.org. The Electronic Frontier Foundation is the leading organization protecting civil liberties in the digital world.